As Greece readies to revise its statistics, it is worth trying to understand this sore subject. After all, doubts about the numbers lie at the core of the distrust and hostility that markets and governments have toward Greece. This is a complicated subject and it is also intensely political. For research, I have relied on two Eurostat reports on Greek statistics done in 2004 and 2010. I have also consulted a documentary from the Greek show "Fakeloi," which is available online (in Greek only). - In April 2004, when a new government came into power, it ordered a "fiscal audit" that resulted in significant revisions of Greek deficit and statistics going back to 1997. Under this revision, Greece was shown to have been above the 3% deficit ceiling in 1999 - which means it would not have qualified to enter the Eurozone. - In September 2006, Greece reported a large revision in GDP, which rose 25.6% for the base year of 2000. The press seized upon the fact that the revision included the incorporation of some illegal activities such as prostitution, but these made up less than 1% of GDP. 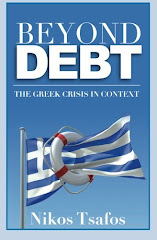 - In October 2009, Greece made significant revisions to its 2008 budget deficit from 5% of GDP, which is what it had reported in April 2009, to 7.7%. Not only that, but the change was preceded by another revision also in October 2009 which put the deficit at 5.6% of GDP. So within 19 days, the 2008 estimate rose by €3 billion. Greece also revised its estimate for 2009 from 3.7% of GDP to 12.5% (although the minister of finance says the latest available estimate was 6%). Beyond these headline events have come other revisions. 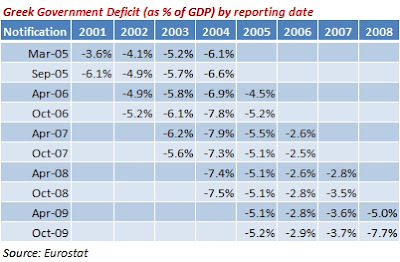 The table below by Eurostat shows the revisions in government deficit statistics since 2005. On average, there is a 1.4 percentage point, difference (33%) between the highest and the lowest number that the government has reported for any given year. Eurostat writes that such revisions are "extremely rare in other EU Member States, but have taken place for Greece on several occasions." The 2004 Revision: Politics or statistics? The 2004 revision remains controversial - so this is also a good case study into the subject of Greek statistics. According to the PASOK (government in place until 2004), the 2004 revision was little more than a politically motivated accounting twist to make the PASOK years look bad and alleviate some the fiscal pressures that the New Democracy government would face. PASOK claims that Eurostat allows countries to report military spending in two ways, and that New Democracy just switched from one to the other and thus "re-wrote" history. A few years later, Eurostat eliminated the reporting method chosen by New Democracy, vindicating PASOK. So is this story accurate? It is indeed accurate but misleading. First, only 60% of the 2004 revision came from how military spending was reported - thus saying that the audit was merely about changing accounting methods is incomplete. Second, PASOK seems to suggest that all was good in its own accounting and that New Democracy merely changed the reporting method for military spending in order to make PASOK look bad. The question of military spending is this: Eurostat says spending should be recorded when military equipment is delivered. But in Greece and many other countries, that information is confidential so statistical agencies and finance ministries often have trouble obtaining the data and compiling honest accounts. In those cases, Eurostat suggests that the spending be captured when the cash is delivered throughout the contract duration. New Democracy answers that in fact, the reporting was done with neither method and that much spending showed up nowhere. According to Eurostat, the government said in September 2004 that, "although the method for recording expenditures was based on deliveries, in fact no information on deliveries was ever received by the NSSG and the Ministry of Finance since 1997. Therefore most military expenditures covered by borrowing were not recorded since the last 7 years." Eurostat had raised the question of military spending in 1996, 1997, 1998, 1999 and 2002, at which point it considered the matter closed based on what it had been told by the government. So it was somewhat surprised when New Democracy said in 2004 that there was data missing and that no recording had taken place for significant amounts of spending. In that sense, the New Democracy government did not so much change the method but instead pick the only measure that was available to give some of what had been spent in the past. At this point, it is very hard to know who is right: did the statistical agency and finance ministry indeed receive all the data as per PASOK’s claims or not as per New Democracy’s claims? It seems hard to say that New Democracy would just make a 7-year paper disappear, but again, I have no proof either way. Still, the impression one gets from reading the Eurostat reports is that there has been systematic under-reporting by the Greek government for several years and that Greek governments had failed to systematically address the subject. In that context - and this is pure conjecture - I am more inclined to believe the New Democracy line of reasoning. The 2010 Eurostat report on Greek statistics highlighted two problems: "problems related to statistical weakness and problems related to failures of the relevant Greek institutions in a broad sense." My sense is that there are three views on Greek statistics: first, revisions are normal accounting practice and no big deal; second, that the revisions come from political pressure; and third, that revisions reflect the fact that no one actually knows what the truth is. The focus on the first two distracts the fact that much truth rests with possibility three. Begin with the first view. Yiannos Papantoniou, finance minister when Greece joined the euro, holds this view, arguing that statistics and accounting is about judgment: "Greece did nothing different than what France or Germany or any other European country did in its effort to present the best possible fiscal picture to achieve entry into the Eurozone." George Alogoskoufis, the finance minister who led the 2004 audit, sympathizes; when asked whether Greece joined the Eurozone with fraudulent numbers, he says that Greece joined with "broadly speaking correct numbers." But obviously, he also thinks that there were systematic distortions in Greek statistics. What is very interesting about the 2004 debate is that for the vast majority of people and pundits, their main issue was not that the Greece may be cooking the books but that Greece was getting a bad press for cooking the books. John Stournaras, a former economic advisor to PASOK and now in charge of the IOBE think tank, notes that the 2004 audit led to a minor revision for the 1999 deficit and that "for just 0.2% of GDP, Greece received very much bad publicity in the international press." The second view, held by Nikos Karavitis, former Secretary General of the National Statistical Service of Greece, is that there are pressures from other parts of the government on the statistical agency to produce figures that conform to the predictions made by the other ministries. In that sense, the NSSG is really doing its job as well as it can and then others fiddle the numbers for political ends. This broad view is also what PASOK effectively accused New Democracy of going in 2004 - twisting the numbers to serve political ends. At the extreme end, there is also of course the view of outright manipulation – for example, Mike Lewis reports on how Greek inflation and budget statistics were systematically distorted. This brings us to view number three, which is that there are deficiencies in the collection and reporting of Greek statistics with unclear and overlapping (or non-existent) authorities that carry ultimately responsibility for the numbers. If nothing else, this is the image one gets as one delves into the subject. The lack of statistics is a symptom of the broader lack of accountability - how to manage, how to assign blame if one has no idea what is happening? The public sector - from local governments to hospitals - is notoriously deficient in its book keeping. No supply of good data because there has been no demand for good data - until now. In October 2009, Jean-Claude Juncker, president of the Eurogroup of finance ministers, said, "The game is over - we need serious statistics." As I look into Greek statistics, there is one other quote that keeps coming to mind from Mr. Willis of Ohio (from the namesake West Wing episode). Mr. Willis is a high school social studies teacher who replaced his deceased wife in the House of Representatives. This self professed "dummy" who is "not nearly as smart as [his] wife" has one issue that we see him struggling with: using statistical sampling to do the census. Toby Ziegler, White House Communications director, manipulates Mr. Willis' lack of experience into accepting sampling. In the exchange that follows between Mr. Willis and Mr. Ziegler, Mr. Willis says: "I think the problems that we're going to face in the new century are far beyond the Wisdom of Solomon, let alone me. But I think the right place to start is to say, fair is fair. This is who we are. These are our numbers." What a thought.